Understanding your options when it comes to signing up for Medicare can help you save time, trouble and money. (NAPS)—Don’t look now, but the baby boomers are starting to retire. Between 8,000 and 10,000 of them will turn 65 each day for the next 15 years. As more and more Americans near this milestone age, important decisions about when to retire and when to sign up for Medicare benefits will be on the minds of millions of Americans. This new generation of retirees is living and working longer than the generations before. Increasingly, new seniors are looking for guidance on health insurance options, including Medicare benefits, as they consider delaying retirement or continuing to work part-time past age 65. In an effort to inform Americans nearing their mid-60s (and their families) about Medicare benefits, enrollment deadlines and tips for avoiding penalties, the Transamerica Center for Health Studies (TCHS) has developed a helpful guide that lays out the key information in one place. Medicare offers health coverage for anyone 65 or older, regardless of income, if he or she worked or paid taxes for at least 40 quarters (10 years). Seniors are eligible to enroll in Medicare for the three months leading up to and after their 65th birthday. So if you were turning 65 in April 2015, for example, you would be eligible to enroll in Medicare from January through July of this year. Anyone else seeking to sign up in the program or make changes to his or her Medicare benefits can do so only during an eight-week period every fall known as Open Enrollment. The period typically begins in early October and runs until early December. There are two essential options for Medicare coverage. One option is to obtain Part A, B and D coverage. Part A covers hospital insurance. Part B is medical insurance. Part D is prescription drug coverage. These three parts work together to create an insurance package that is similar to a fee-for-service/PPO model that many health plans offer. The other option is to obtain coverage under Part C. This model is more like a traditional HMO. The coverage is more expansive than the Part A/B/D model, and there are caps on how much an individual will be asked to pay out-of-pocket, unlike the Part A/B/D model, which has no out-of-pocket cap. But with Part C, there is less patient control over doctor choice. The trade-offs essentially mirror the HMO vs. PPO trade-offs we make in the private insurance market. To avoid penalties, anyone turning 65 must choose to enroll in Medicare A, B and D, or Medicare C. Part A is free to anyone who has worked for at least 10 years. There are monthly payments associated with Parts B and C.
There are a number of different coverage plans under Part D, each with a different level of coverage and patient co-pay for prescription drugs. Those who do not enroll in Medicare within three months of their 65th birthday are subject to penalties and higher monthly fees after enrollment. For example, if someone misses the initial enrollment period for Part B, he or she faces an additional monthly premium of 10 percent for every full 12 months he or she was eligible but did not enroll. Registration for Part C is available during initial enrollment period or during annual enrollment periods, without penalty, once Medicare coverage is in place. Medicare Part A covers hospitalization expenses, including hospital care, nursing home care, hospice and home health services. It is free if you already receive or are eligible to receive Social Security benefits, if you or your spouse has worked and paid taxes for at least 40 quarters (10 years), or if you are the parent of a fully insured deceased child. There may be other circumstances, such as specific medical conditions, that allow an individual to qualify for Medicare Part A before he or she turns 65. Medicare Part B covers medical and preventive care services, such as lab tests, flu shots, ambulance services, clinical research, medical bills and medical equipment. The majority of Part B benefits are subject to a yearly deductible ($147 in 2015) and out-of-pocket co-payments, co-insurance and monthly premiums. The standard Part B monthly premium for 2015 will be $104.90. Your actual payment will depend on your income and assets. Those with a lower income or assets may be eligible to receive assistance with Part B payments through a variety of programs, such as Medicaid. Medicare Advantage Plans are offered by private companies approved by the Centers for Medicare & Medicaid Services and are similar to private insurance that’s available through the traditional health insurance marketplace. Medicare Advantage Plans cover emergency and urgent care needs and may offer extra coverage for vision, hearing, dental, and health and wellness programs. Most Medicare Advantage Plans include prescription drug coverage similar to Medicare Part D.
Monthly premiums for a Medicare Advantage Plan are separate from the Part B monthly premium. Medicare Advantage Plans, by law, have an out-of-pocket maximum of no more than $6,700 per year, while Original Medicare (Parts A and B) does not have an out-of-pocket maximum. Medicare Part D is prescription drug coverage. Enrollment in Part D is not automatic and there is a late enrollment fee for signing up after the initial enrollment period. All the prescription drug plans vary in cost and coverage options. If you decide to go the Part A/B/D route, it’s important to know that Medicare doesn’t cover everything, and there is no cap on what you might be asked to pay out-of-pocket. 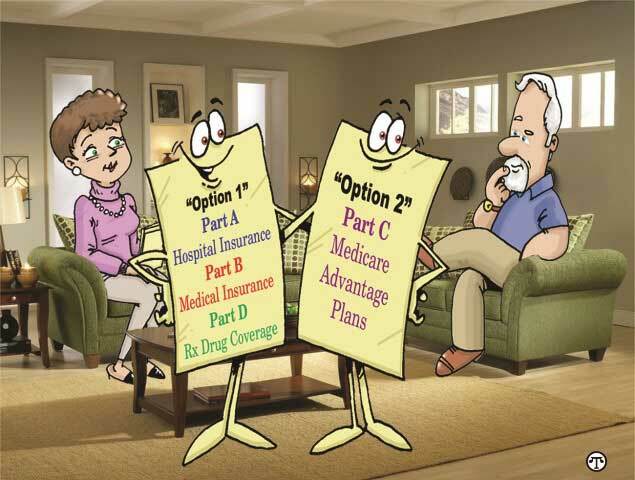 To help, you have the option of buying what is called a Medigap plan. These are supplemental policies that cover services not covered by Medicare Parts A, B and D. These are not a government benefit, but rather insurance policies sold by private companies. Medigap plans are not necessary if you are covered under Part C.
For the complete Medicare Guide or for more information on the Transamerica Center for Health Studies, visit www.transamericacenterforhealthstudies.org/affordable-care-act/medicare-guide.